Grant is also sailing there in the 18ft skiffs - there are 21 of them and they seem to have to fit around the big boats - in fact yesterday the big boats (probably no road sense) came a tad wee close and the race dinghy popped in between. I expect it would have been frustrating - no doubt we will hear more if it was. 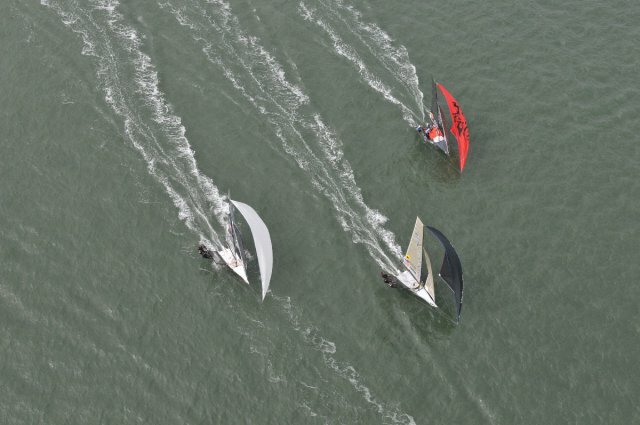 There are quite a few kiwis in the fleet and they are running 1st and 2nd after 6 races - Grant is coming third. 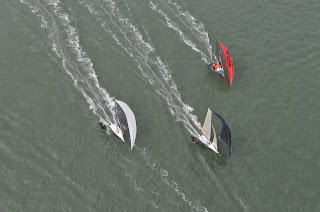 There is the on Fisher and Paykel in the middle - he has a back swan on his sail and a nice black spinnaker. Back at base we are working away flat out - I have decided it is time to cut and roll all the silk laps - they are everywhere in the kitchen but I got through a few today. A little more under control now. I have also started packing etc for London because it will catch up on me so one box is done. full of threads and fabrics so far. 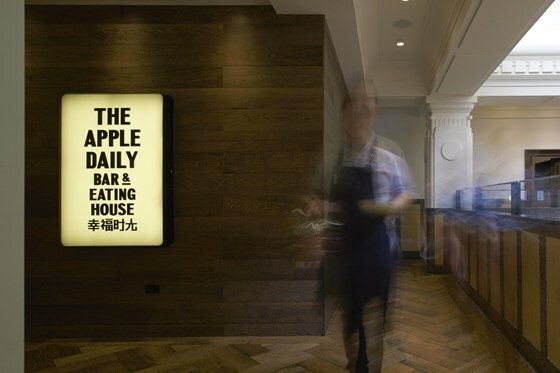 The other night we went to the Apple Daily - Perth dining down town has grown up and we could have been in Melbourne or London. It is in Print Hall - excellent food. We don't usually go into town to eat but will be back here again. Tonight, though, we are off to Ace Pizza because James the chef is finishing this week - things might change after that. Some of those boats look so big but the skiffs are very smart and nippy. You should write a book on dining out in Perth - it could be a best seller! Hope you manage to keep fibres out of your recipes when cooking at home! !